Hike, bike, golf, ski or just view the mountains! They are all available right out your back door at this lovely townhome ideally located next to Bridger Creek Golf Course and the Bridger mountains. The trail system with endless trails, perfect for summer hiking or biking or winter cross country skiing, runs adjacent to the townhome and Bridger Bowl is only a 15-minute drive away. Grab your golf clubs and hit the links just up the road. Or in five minutes you can be in downtown Bozeman and all it has to offer. The lovely home has an open floor plan and provides a great space for hosting family and friends for dinner or an evening in front of the fire! With stainless appliances and lots of counter space, the fully equipped kitchen is a joy to work in. Everything you need is at your fingertips. 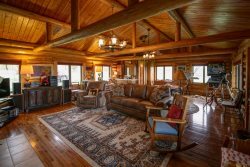 So whether you open the sliding glass doors to sit on the patio while enjoying the fresh, mountain air; or whether you cozy up on the couch next to the gas fireplace and watch the snow fall, this home provides everything you need to relax and enjoy your Montana vacation!